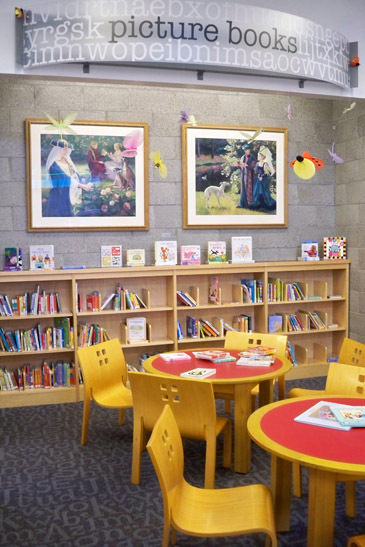 When The Children's Store moved to its new location, not only did we have to update our blog post and remove our now-outdated photos (gasp) but more important to you is that they started a new storytime! First, if you haven't been to the new location, you've got to go. It is gorgeous and packed with toys. Yet easy to shop in, too. And, of course, they have a train table for kids to play. In addition they have a coloring table, complete with pages and crayons, for kids to enjoy . The storytime happens every Wednesday at 10:30 am in the store. And this was great! It felt so cozy. 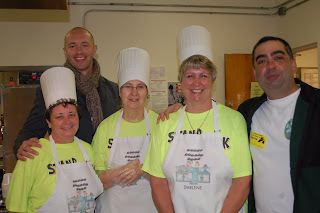 It was a solid turnout of friendly families, and the staff was warm and welcoming. C was a little too young for this storytime, the book chosen trended more to the older kids in the ages 4 and 5 range, but we still had fun. And the staff and the reader didn't mind my son's enthusiastic yells at other toys seen nearby. 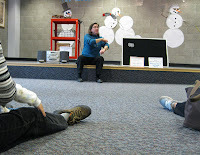 Kids in that age range were fascinated, by the way, so very successful storytime. All storytimes are accompanied by a craft. This craft fit the book and was so cute (little puppet lions). All the kids, of all ages, mastered this craft. The only thing to contend with is your growling stomach-- either Jersey Mike's or Harvest Bread Co. bakes fresh bread at this time and it smells heavenly. I was going to wait to attend one of the events before sharing an article with you about it, but, honestly, there is so much going on and it is too cool to wait for me to get my slow-as-molasses-these-days-mommy-rear-in-gear to get there. Thus I am going to share with you what I know about a really great challenge going on in Chatham County Schools right now. There are many events surrounding this challenge. But the gist is as follows: some pretty top-notch chefs in the area (Chef Colin Bedford from the Fearrington House Restaurant, Chef Jimmy Reale of the Carolina Inn and Chef Gregg Hamm and Kelly Taylor of The Natural Chef Culinary Program at Central Carolina Community College) are competing to see if they can entice the pallet of kids. But they are competing against some tough contenders: nachos, chicken nuggets, pizza, and the like. These chefs are trying to create healthy lunches that kids like just as much as these standard foods that are currently served in most cafeterias. The chefs have to use school ingredients, lunch ladies, and follow USDA guidelines. And they are leaving it up to the kids to decide. The kids get to taste test and provide their votes. Right now, select kids (ones with an interest in nutrition and culinary school) have been going to each place and interviewing the chefs. They are getting a behind-the-scenes look of what happens in a major kitchen. Moving forward, there will be a tasting of the dishes by kids, the toughest critics of all, April 11-13. Yet the tastings occur against the standard cafeteria fare, too. Then all the chefs will be showcasing their items at the Briar Chapel Earth Day Celebration on April 16th. The other week, I took C out to the all new Vimala's Curryblossom. This is a new cafe located where the old Sandwhich was. And although I have eaten here before and really enjoyed the food, this time we went for music! In a burst of brilliance, Vimala's has decided to take some off hours, every other Friday morning, and offer a Baby Singalong. This is "baby" used lightly, since we went and it seemed a perfect fit for C's age. This started off with a craft inside. We made musical instruments (shakers), but the craft changes. This was such a cute little get together! I have the feeling that this is basically a bunch of friends who get together and invite others to attend. Which is fine with me, and they were really sweet. It wasn't well attended when we went, with only 3 families, so it was quiet (in fact, in a moment of 'why I love Chapel Hill,' I wasn't sure it was still on and went traipsing down the street instead, when a young man working on some construction at Carolina Brewery yelled at me across Franklin Street to let me know that there was a baby singalong in the Courtyard, random!). The ages of kids who showed up was extremely diverse. Yet the adults running the event and the musicians who were playing were so laidback and welcoming that it seemed to alleviate any potential awkwardness. And honestly, it might be awkward only for parents; I can tell you that C had a great time. He loved dancing and loved the fiddle. No fee for attending, but I think that donations are accepted. No food at this time of day from the cafe, but they do provide a fantastic banana and yogurt dish for kids to snack on if they want. Baby Singalong happens at 10 am every other Friday. Next one up is this Friday, April 1st, but check online before you go. This is such a great little gem that few people know about in Chapel Hill. But it's music, snacks, crafts, and it's free! So go enjoy and let's make it popular! We closed up entries Sunday afternoon, and we're here now to announce the winner of one WonderDads of the Triangle Activity Guide. Chosen by Random.org, our winner is Julie. Julie says that one of her favorite places to eat as a family is Mellow Mushroom. You guys are the source of our best ideas and best advice, so thank you for contributing! And congratulations to Julie on her win. If Julie could email us at mominchapelhill@gmail.com to collect her winnings, we'd appreciate it. I'm really enjoying taking D to storytimes. He loves books, it gets us out of the house and they are usually free activities. All positives. It's also a great opportunity to begin teaching him to sit and be attentive for a short period of time. No, we're definitely not perfect at it, but that is one of the beauties of age appropriate storytimes - you can rest assured the other parents and children are dealing with the same issues. 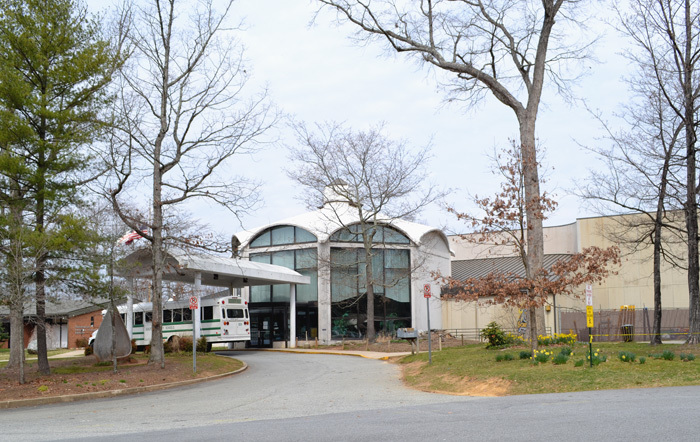 Most recently we've attended two different storytimes for young children at West Regional Library in Cary: Mother Goose Magic for ages birth to 18 months and Toddler Time for ages 18 months to 3 years. Technically, D has outgrown the Mother Goose Magic, but I thought we would check it out anyhow since we never managed to make it when he was in that age bracket. The main dilemma for us was the time fell during nap time and he took two naps almost all the way to 18 months. I wasn't willing to give up a nap for a story time as I'm sure all parents can relate! I really loved this story time and wish I had been aware of it when D was really young (ie, non-mobile days). It was fun filled with songs & rhymes with movement. One of the rhymes we did was Itsy Bitsy Spider. All the kids were in parents' laps as the parents recited the rhyme and did hand motions in front of them. Some of the older kids made a few movements themselves. The downside of taking a slightly older child, as cute as I thought this storytime was, it didn't hold D's attention as well so we actually left this one early and went to the board book area to look at books on our own. While at that point, let me add that West Regional Library has a lovely, bright children's wing. The building itself is a 'U' shape. You enter through a long courtyard in the center. Adult section to the left and children to the right. The books for the youngest children are at the opposite end from the entrance - well placed to keep noise from the adult side. There are a couple of comfy reading areas here, but my favorite is at the board books. There are 2 small toddler/preschool height tables with wooden chairs and 2 adult size plush chairs. Books are arranged alphabetically by the first letter of the author's last name - so all that start with "C" are grouped together but you won't necessarily find all Eric Carle books together if that makes sense. It can be a little frustrating for a novice looking for a book, but I quickly realized how smart this was when you have lot of little fingers pulling books out. I'm betting they do a lot of reshelving in that section throughout the day! The Toddler Time storytime fit us much better. It, too, was a mix of story and rhyme and movement. The latter is so great for toddlers that well, need to move! During our visit, we talked about the kind of clothing needed for the cool weather that day and in which order to put it on. There was a great song/dance time that featured a body part song different from "Head, shoulders, knees and toes." It really caught D's attention and surprised me as it was the first time he'd ever gotten up and joined in. No, he didn't hit every body part perfectly or on cue, but he sure enjoyed dancing to the music! This dance helped all the kids work out some wiggles to make sitting through the story easier. The staff member also did a fabulous job reading the book with some excitement. It was clear looking around that some of the kids (regardless of age) had experience from being there multiple times. Loved that and will be taking D back again. If neither of these storytimes work for your schedule or kids' ages, check the website (listed below) for further opportunities. Also consider the evening Pajama Time storytime - it's fun for the entire family. * Check the events listing on website for days/times or call the library to confirm. There are occasional breaks when storytimes are not offered. 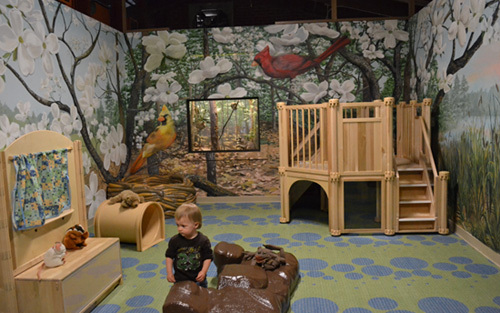 It seems like there is a battle in the Triangle area: what is the best indoor play gym? Who has the best inflatables, the best location, the best price, and the best overall experience!? Ugh. We have no idea. 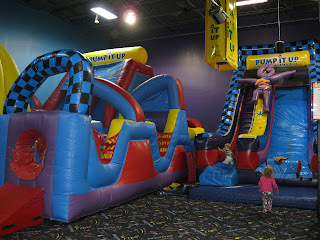 But we have been to quite a few indoor play spaces here at MiCHill, and I can say that we thought Pump It Up was great. We went there for a Pop In playtime. Located close to Brier Creek, there are lots of other reasons to head to this area. And it wasn't too hard to get to. Inside there are two large rooms, both open for play. 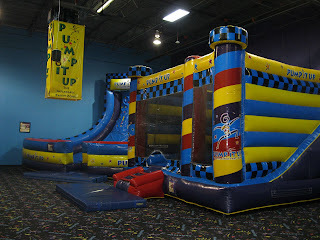 There are inflatable slides, obstacle courses, and bounces with big boxing gloves and basketball hoops. Nothing is themed, a la TK's Jungle, but it was all really clean. There were two parent lounges, one in each room. And while there weren't massage chairs, a la Monkey Joe's, there were tables, chairs, very nice tvs with dish service, and free wi-fi. C and D were some of the smaller kids there, but it was completely enjoyable for them. Only one of the inflatables felt like it was only for older kids. Just as enjoyable to the kids were the hoops for play. These had nothing to do with any of the bounces. These were just play hoops that were small and could be rolled around. Big hit. What we liked best about Pump It Up is that it seems relatively undiscovered (shh, don't tell anyone). We were worried as when we checked in the guy at the front desk said that there were "a lot" of kids checking in. But really, it was fairly empty. And it felt so quiet! Of course there were generators running to keep things inflated, but other than that it seemed relatively calm. No staff overseeing play. It's up to parents to monitor their children. Very limited concessions, but no food or drinks allowed in the play arenas anyhow. We paid $7 per child to play, and we could stay for a total of two hours, although we didn't last that long. 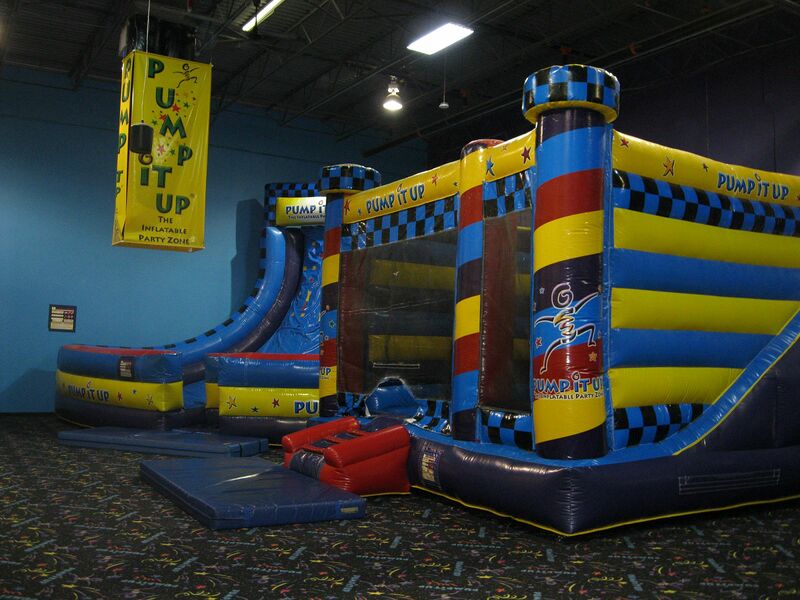 Pump It Up does a lot of neat events, including a fundraiser that is coming up, and a program called Jump N Art. They offer a variety of birthday party packages. 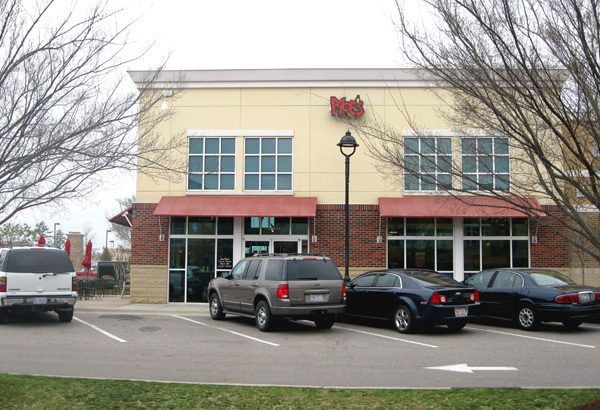 A lot of our readers have mentioned how great Moe's is for kid's dining. And we have read about it in a few books and articles. So when Sarah C. and I were out and about on a different exploration and we needed a place to grab a quick bite, Moe's was our pick. You all are right: this is a great little spot to get quick eats for kids! 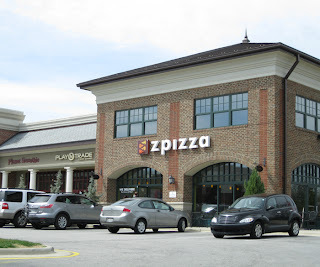 They are all over the Triangle in highly-trafficked areas like Southpoint, Brier Creek, and even a new one opening over by New Hope Commons (you know, where the Starbucks, Home Depot, Panera, PetSmart, and DSW are). The food at Moe's is pretty tasty. They advertise no microwaves, no trans fats, and no MSG. They also state that they have over 20 fresh ingredients prepared fresh daily. Which is pretty big for a fast food chain. Moe's has a kids menu with some good options like plain quesadillas and tacos. All kids meals come with a fountain drink, cookie, chips, and a side of salsa (which D actually eats with a spoon. Seriously!). It would be nice to see some sort of fruit or vegetable side, but the kids don't mind, of course. Moe's is pretty cheap to eat at. And parents can even get an adult beverage if they wish. Even better?! Kids eat free every Tuesday! Hooray for deals! Plenty of high chairs at all the locations I have been to, and from what I have seen the locations have changing tables in the restrooms. Most locations have limited outdoor seating, too. C and D seemed very interested at first in the loud "Welcome to Moe's" that was bellowed by all staff to anyone who walked in the door. It was like entertainment for them. But don't worry, parents, you will be surprised how quickly you can drown it out and make it background noise. Remember in the Graham, NC post when I went all nostalgic over the soda shoppe? Well, I don't have to drive to Graham anymore to get that experience! Right in downtown Pittsboro is the S&T Soda Shoppe which can get me nostalgic about a time in America I didn't even live in. C and I stopped here on a visit to Pittsboro Toys and the Pittsboro Kiwanis Playground. This place is decked out with memorabilia from bygone times and is kitschy and fun to browse. Lots of things around here to catch your eye. There are booths and tables (and high chairs). And there is an ice cream counter to sit at - complete with a group of tweens fresh from school getting some ice cream. We opted for a milkshake, but S&T's has a full service menu as well as ice cream scoops and candies. They have fizzie sodas! And I have to say the milkshake we got was huge and delicious. Prices were reasonable and service was friendly. So take your family here and reminisce with them about how things used to be. Ya know, when you would walk to school in barefeet, uphill both ways. Update 3/24/2011: Thanks to reader Jodie. She talked to someone at Durham Parks & Rec to get the skinny. Turns out there used to be a playground here, but it is now gone. Sad for a missing playground, but good to know I am not going crazy! We like to provide you answers here at Mom in Chapel Hill. But this post is one big QUESTION: Where is the playground!? I have been heading to the JoAnn's Fabrics in Durham a lot recently (did you notice I dropped a novice sewing reference into the Fleming Clothing post?). On a recent trip I decided to swing by a park to let C burn off some steam during errand running. I switched on my handy GPS and found Southern Boundaries Park. It was quite a lovely park. The tennis courts are in great condition, there is a basketball court, some short paved walking paths, and a baseball diamond. Lots of places for a kid to run around. We enjoyed our time here. But blog-friends I ask you: did I miss the playground? I swear we walked the whole park and didn't see one. Yet Durham's Parks and Rec website states that it has one. Google Maps Earth view doesn't show one, yet Durham insists that one is there. So please, if there is, indeed, a playground at Southern Boundaries Park, will someone please let me know? I will happily be embarrassed. It is so convenient to Shannon Road haunts and JoAnn's. And I already need to go back there for more elastic thread. We believe in being fashionably late here in my house. Many of you mentioned Balloons & Tunes in Carrboro after we did our Balloons Above Orange post this past summer. Without waiting too much longer, here is the post! Balloons & Tunes is in downtown Carrboro, next to the NC Craft Gallery. It has been around for years, and has a variety of offerings. There are, of course, balloons to buy. They even have a 4 foot tall Elmo balloon to sell you. Fantastic! There are also a lot of little baubles and trinkets, for cheap, to buy as party favors. These run the gambit of style and age range. 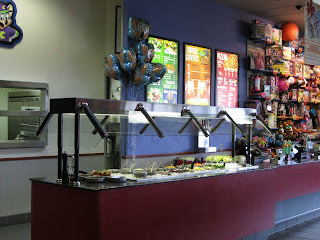 Balloons & Tunes also has a limited selection of party plates, napkins, party hats, streamers, etc. The selection of single mylars for sale wasn't as diverse as Balloons Above Orange. But the real thing that Balloons & Tunes has going for it is its balloon creations. If you Google the business (no website) you will see pictures of party creations like balloons arches and more that they have created and delivered. The other thing that makes this shop so great? How incredibly nice and helpful the staff is. These ladies were so sweet and genuinely interested in how they could meet my needs. Which is a great reminder why local business is such a great thing to support. You may think we're all about the moms here, but we know how many of you great dads are looking for ideas, too, so we're really not all estrogen. Promise. In fact, we have a great little giveaway for you all this week. 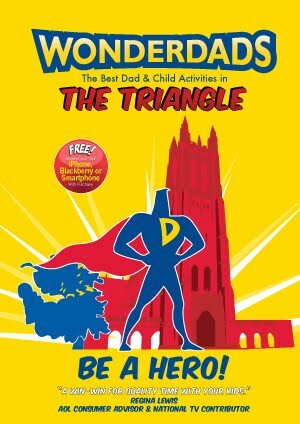 A new book was just published called WonderDads: The Best Dad & Child Activities in the Triangle. With the subtitle "Be a Hero!" This little book is svelt, succinct, and great. At only 100 short pages, it is full of lists. The front of the book lists the Top 5s (Top 5 Dad/Child Parks, Top 5 Dad/Child Things to do on a Rainy Day, etc.). Then the rest of the book is divided by restaurants, activities, stores, parks, unique adventures, and sporting events. There are a lot of ideas in here. But they aren't detailed. They will give you the list and the contact information, but no real details. We like to think that that would be what a certain humble blog (ahem ahem) is for. And this truly is for places all around the Triangle. It hits spots in all the major cities. So we are at the best part: where we give one of you lucky readers a copy of this book! Since WonderDads lists a lot of family restaurants, we're asking you to tell us your favorite place to eat with kids. And that's your entry. We'll pick the winner at random from all the entries at noon on Sunday, Marcy 27th. I like to be honest with you all. And I will say that Sarah C. and I were dreading going to Chuck E. Cheese. My dread was related to a birthday party I had at Chuck E.'s as a kid in Maryland, and losing a special bracelet to the Chuck E. ball pit (not sure if Sarah had such seedy secrets to cause her dread). But we love you blog readers and know that a blog about Family Activities in the Triangle has to include this stop. Good news: it wasn't that bad!! More good news: no ball pit to lose things in!! Hooray! In fact, Chuck E.'s has come a long way since my memories of it. This place was very clean and well lit. There are still the singing mechanical characters, of course (every half an hour!). There is still cheap pizza and eats, but they have now added a salad bar. The food isn't going to be appearing in any foodie blogs around here, but it looked decent. And there are loads and loads of arcade games to play. I mean, loads. They run the gambit of ages and skill (we were fans of the fish game that required absolutely no skill but lots of banging of keys). Although no pinball. Is pinball out of fashion now? 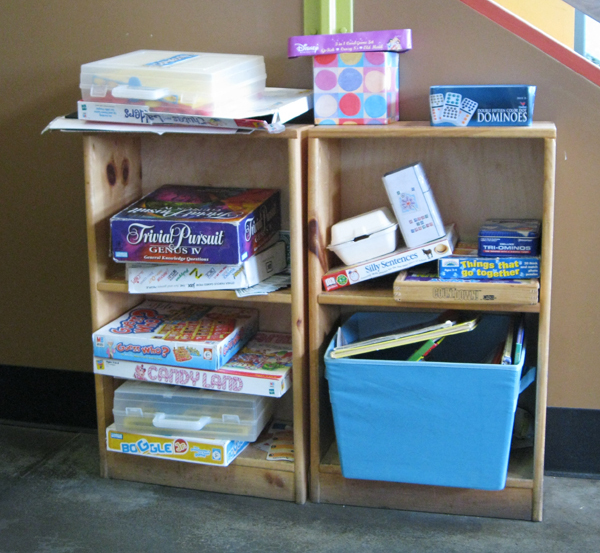 Games are tokens, generally just 1, to play. One token costs a quarter. But your newspaper or local mailer will most likely have a coupon you can clip before you go (check the website too). At the end of play, you get tickets you trade in for prizes. 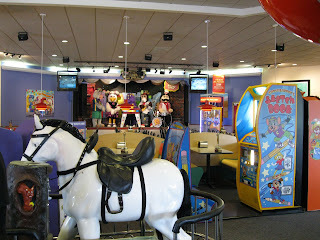 At Chuck E. Cheese's there is even a little "hamster run" for kids. You know the kind I mean, where they are all in tubes and tunnels up in the sky. Kids love it, and it is free to play in it at Chuck E.'s. In fact, entrance to the entire place is free. The only thing you have to pay for is food, if you want it, and games, if you want to play. Another great thing about the place? The hours. It is open all the time, from 9 am until 9 pm or 10 pm depending on the day. We were there at 10 am on a gloomy Wednesday looking for something to do. One thing I found really difficult to stomach was the sheer noise of this place. We were the only people in there (again, it was a 10 am on a Wednesday) and it was sooooo loud with the games, music, tv videos, and singing characters. I can't imagine how loud it must get with screaming, excited kids added in to the mix. 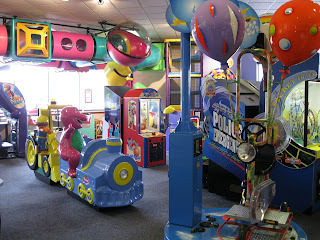 Chuck E. Cheese is really popular for birthday parties (as yours truly has experience with) for good reason: everything is in one spot! Food, variety of entertainment, and plenty of seating. So if you want to use the spot, book early! Remember the post I did awhile ago about Fleming Clothing and the ordering process? Remember how I promised to share the results when it arrived? Well, it's here!! So here he is in the fancy jacket. Say hello! (And sorry for the stamp on his chin, but he is so stinkin' cute I worry that someone out there in Internet-land is going to try to swipe the picture and use it for their own devious means. Hence the over-protective-mama-stamp on his face.) Ok, so, rambling aside, you can see the awesome little jacket he now owns: I have to say that this jacket is fabulous! Yes, it is a little big right now but that's because of me: I ordered it that way since we have a fancy event I want to use it for in the near future and want to make sure it fits. Because I totally intend to show-off my child in his very good-looking clothing at the event, and this is is the piece of clothing I pick! It is a show-off worthy piece of clothing. This really is such a high quality jacket. I am so impressed with the details, the stitching, and the durability of this piece. And as someone who is a novice sewer, I am in awe over the professionalism of this article of clothing. I can't believe someone made this by hand, and just for C. Fully reversible with pockets on both sides!! It is whimsical with the puppy print yet also very serious as a tailored piece. Perfect. I want to thank SG and Patti for turning me on to this designer in our town. But don't take my word for it. Do your own exploring and online designing and see what you think! The first playground is located close to the entrance and tucked next to a couple of baseball fields. I didn't notice any signage, but my personal guess is that it's better for larger children. My son did manage to make it all the way to the top and loved that spiral slide, but there are a couple of openings at the top that made me nervous. The entire play area is mulched. Just beyond the mulch is a ring of dirt that, luck would have it, had a number of mud puddles during our visit. Oh, yes, we left with mud on shoes and pants. I did love all the trees here. On a really hot day those should shade it nicely. There are restrooms immediately adjacent to the playground. The second playground is in the back of the park next to the sand volleyball and tennis courts. It's signage designated it for ages 2-12. All 3 of our toddlers had a great time climbing and sliding. Some sections were a bit above their abilities, but it was overall more manageable than the first playground. Another plus were the swings - standard and bucket style. This play area is also mulched and is located more in the open than the other. There are bathrooms available in a building across the parking lot next to the tennis courts. So a friend recommended Tutti Frutti, the frozen yogurt place in Hope Valley Square, to me as a place our blog readers should know about. And since it doesn't take much to convince me to try out a sweet shop, Sarah C. and I were there the next day. Like I said: I like my ice cream. Good thing I work out. This place is great! This is the Orange Leaf for this side of town. 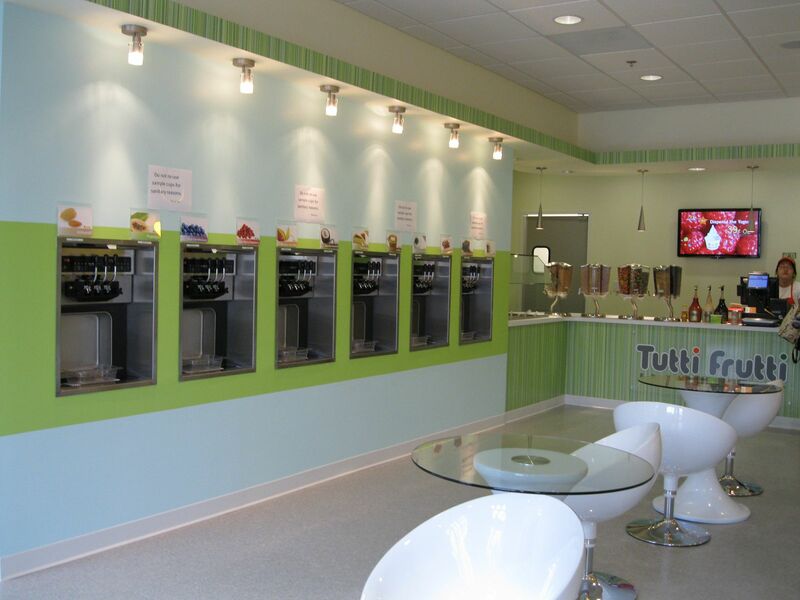 You walk in, pick your yogurt flavor out of the many, many options on the wall (you can mix and match); pick your toppings out of everything from sauces to fruits to candies; then you pay based on weight (they subtract out the weight of the cup). This was soooo tasty and I have to say may give Local Yogurt a run for their money. The create-your-own aspect of this is a hit with kids. There is seating inside, very modern. 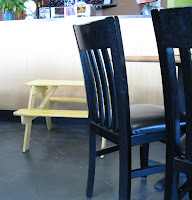 There are big white chairs, bench seats, and glass-topped tables. Alas, only one high chair. There is also some seating outside which will be nice when the weather turns warmer. Things to pair your visit to Tutti Frutti with: pizza at Pop's Backdoor South or Durham's Southwest Regional Library. Rick's Diner and Only Burger's standalone shop are also in this shopping center. My dad and I took D to the Natural Science Center of Greensboro earlier in the week. It was a bit of a trip down memory lane as my dad took my sister and me when we were kids. There have been a few changes since the small building and little fenced in petting zoo that I remembered! The first thing to catch my eye as we walked into the lobby was the pendulum that passes through an opening in the floor to the lower level, which I clearly remembered from all those years ago. I was excited to see what else the Museum had to offer. 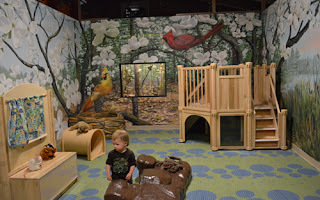 We headed first to the special 5 and under areas - Kids' Alley and Nature Nook. since I was ready to move on and see how the petting zoo portion had changed. Turns out what was once a small petting zoo and a few monkeys is now way more. 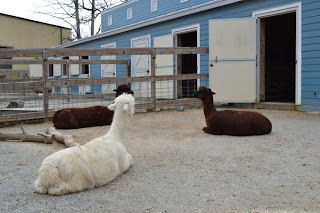 There were alpacas, tigers, donkeys and wallabies just to name a few of the animals we saw. 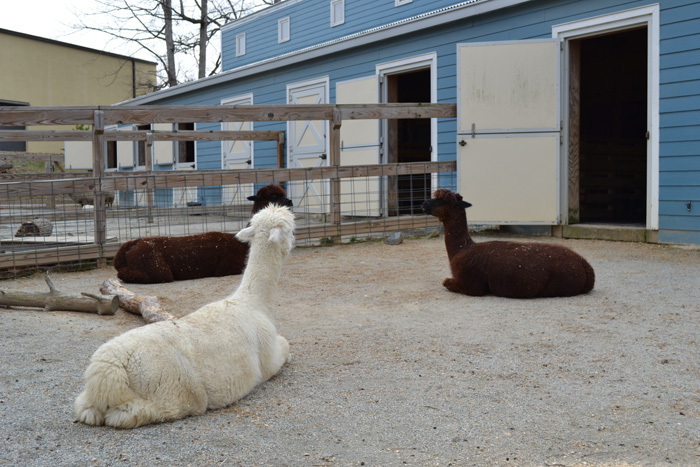 Some animals were off display due to the chilly weather. A few feathered friends (turkeys and peacocks) walked right up to us. We had a blast here, even though one of the turkeys did "adopt" us and proceeded to follow us around. After the petting zoo we returned inside to find aquariums of fish, snakes and lizards on the lower level. The Science Center has several classroom spaces including a Physics Lab, where we watched older students working on a project involving Legos (see the website for details on classes & workshop). Like I mention above, be aware as this is a popular place for school field trips and can get busy in areas at times. Of course, 5 and under spaces will always be excellent for a free roaming toddler and I loved how many hands-on activities there were! Food and drinks are not permitted except in the lunchroom on the lower level. Here you will also find vending machines. No other concessions on site. The OmniSphere Theatre located in the center of the main level offers daily shows. Check the website (listed below) for show descriptions, times and ticket prices. The show fees are separate from admission. There is an admission fee of $8 for adults; $7 for adults 65+ and kids ages 3 to 13; kids under age 2 are free. Some discounts are available, including a discount for members of the NC Zoo. Check the website (listed below) or ask at the front desk. 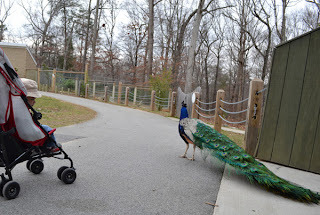 So not only does Greensboro have the fantastic Greensboro Children's Museum, but if you needed another reason to explore the Triad, I definitely recommend the Natural Science Center! You really can't miss Briar Chapel. I know, I know...if you are anything like me whenever people say that I inevitably miss it. But Briar Chapel is a new mega-development off of 15/501 in North Chatham County, just past Cole Park Plaza. And the entrance has gazebos, stone walls, beautiful landscaping, and extremely large art pieces of silver ferns and leaves. Really, you will see it. Briar Chapel is still under construction as a community goes, but it already has a lot for families. There is the pool (to come in another post, on another day) and the clubhouse. But for free, for nonresidents, are the walking trails. These trails ramble though some pretty woods and near some beautiful water features. There is a gorgeous bridge that we enjoyed. Also, Briar Chapel has added art stops along the path. The brochure (link below) will tell you what you will se e along the way. The trails are not hard to follow. And you can do close to 3 miles here. Unfortunately, even with two maps linked below for you, none of the maps have street names on them. You don't really need them, though. Park on Catullo Run (on the left off of Briar Chapel Parkway as you enter the community) and then start to follow the path. There are separate mountain biking trails through here (see maps below) but they do not share paths with hikers, unlike the Bolin Creek Trails. Which is nice if you are going to have a child with you. The hiking trails are pretty easy walking and hardened mulch for the most part. Carriers would work best, and you would most likely be able to push a jogging stroller through here. C enjoyed doing his own independent wandering. Unfortunately, since this community is still under construction parts of the path had a lot of trash and debris. Not all around, but just in specific areas. It didn't impede our enjoyment of these trails, though, and I am sure it will be cleaned up soon since overall the trails are obviously well-maintained. After hiking we stopped by Fearrington Village for some yummy treats at The Belted Goat. Carolina Parent notes zpizza in their 2010 Favorite Places to Eat. I confess I hadn't visited since before D was born so Allison and I met there for lunch one day to see how kid friendly it was. Although we timed our visit at 11:30 (not quite lunch rush hour), we were surprised to find it wasn't crowded. There was a decent group of high schoolers, but they were enjoying the warm day out on the patio and even then left plenty of room if we had wanted to sit outside. Instead, we headed inside to order and eat. Similar to other quick-eat style restaurants, you place your order at the counter, pay and then find a seat. Your meal will be delivered to your table. For the two of us, we chose their easy two slice + a drink special which means we actually got our food immediately. For the boys, we ordered kids' meals. Those took a few minutes of preparation which gave us time to fix drinks and get situated at a table. Typically, you'd take your slices of pizza with you but since we had hands full with toddlers and drinks, one of the staff members kindly took it to a table for us. Greatly appreciated that help! Should you find you visit at a busier time or want to order a whole pizza, don't fret there are things to keep your kids occupied. 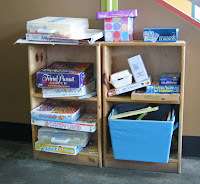 As we searched out the highchairs (stashed in the back right next to the restrooms if you don't see a free one on the floor), we passed a small bookcase overflowing with games. We will definitely try those out in the future. As it was, our boys were entertained with each other and watching the teens out the window. The boys' food arrived quickly. First up, C's special PBJ hold the J order which was made perfectly. Then came D's macaroni & cheese which the server was kindly stirring on her way to our table to help release the steam and help it cool. Again, appreciate this detail! Not that I can't and wouldn't have (still did a bit) but it's nice to see that extra effort because the moment D glimpses it, he wants to dig in even if it might burn his mouth. Another fun detail that made us smile - the placement of a child size picnic table in the dining room and a second one outside. I have to say, I can see why this pizza spot ranked so highly. Good food, reasonable prices (it was about $24 total for all 4 of us), friendly & helpful staff, and special touches for the kids. Yes, I'll be back. Oh and if you find you have some time on your hands after your meal at zpizza, consider a stop at Brilliant Sky Toys & Books at the opposite end of the shopping center. Or maybe dessert next door at Planet Smoothie, further down at Kilwin's Chocolate or across High House Rd at Goodberry's Creamery (another favorite on the Carolina Parent list). 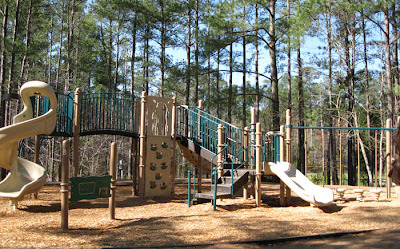 Having some time to kill near the RDU airport the other day, I decided to take C to Woodplay off of Lumley drive. Honestly, he probably would have been fine in the car staring at the planes going by, but I made an executive decision on this one (I lose executive decision making at mealtimes, it seems, but I gain it back in other ways...). 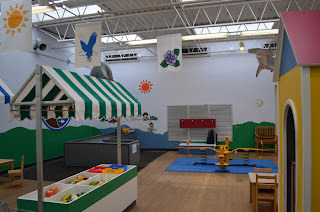 Woodplay systems is very similar to Rainbow Play: it is a showroom for a company whose primary mission is to sell wooden playsets and other outdoor things. This showroom has a lot of goodies in it though and is very fun for kids to play in! Woodplay sells trampolines, so they have some to demo; Step 2 climbers; basketball hoops; water tables; kids' outdoor chairs and benches; swings; castles and playhouses; and who knows what else we just didn't discover. Unlike Rainbow Play, though, there is no option to come in and pay to play. So we were approached by a sales person. I will say he was not at all pushy (although I do think they were curious about why I was whipping out my camera- Research!). And because it is a showroom and not a play spot, we didn't linger too terribly long (plus Aunt Britt made it to the airport quickly and needed picked up). But we still put some damage on a few basketball hoops and swings. In addition to the indoor area, there are a lot of play systems outside to try. So again in the name of Research we tried those out, too. Even though this is right off of Lumley, which can be a busy road, it never felt as though C was in danger of careening into traffic. But it still bears watching your kid, of course. And, like I said, C was pretty happy to see the airplanes flying overhead so this was a winning stop for us. Score 1 for the executive decision-maker! 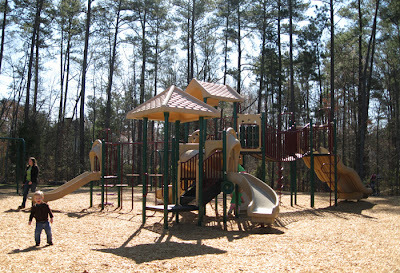 Woodplay Playsets offers a variety of options for configuration of your playset if you want to buy. And you can add on later. But as with any wood jungle gym, you still need to be prepared to pay to play. The good news is the Woodplay is having a Spring Open House on March 26, 2011 paired with a big sale (free installation and %s off). See sidebar for Open House information. Looking for trendy, brand named clothes for your child(ren) and not willing to hand over all that cash? I have a simple answer for you - don't. 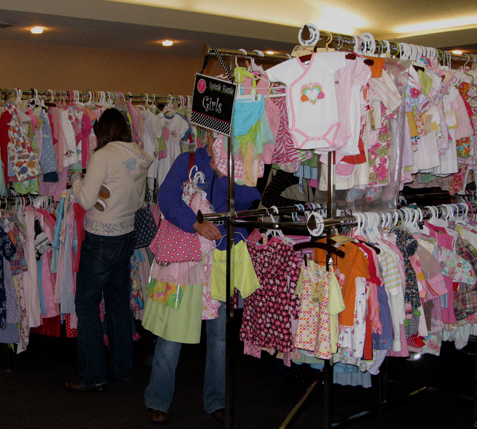 Instead, visit the Upscale Resale 4 Kids children's consignment sale this weekend. Today and tomorrow the sale is open to the public and there are a lot of wonderful items at great prices. but all seemed reasonable. There was a section of clothing devoted to "overstocks." These are new items from boutique brands that are extras, last season or samples. Around the outside edges of the room were tables featuring shoes, accessories, books, room decor, new children's crafts, etc. I even found a few American Girl doll items (yes, I left them even though they might look cute on my Molly doll from my childhood). 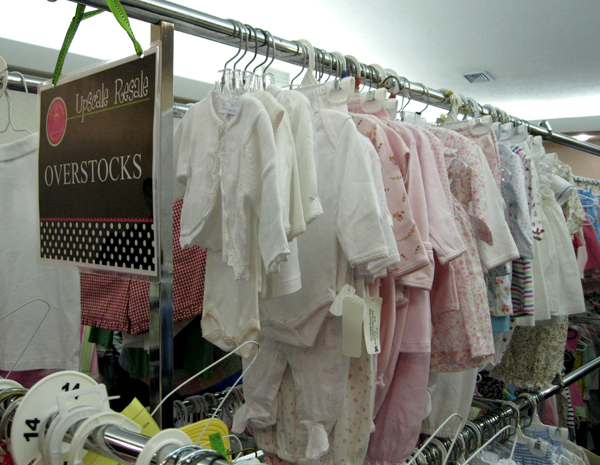 Upscale Resale 4 Kids occurs twice a year in March & August and runs for 3 days (Thursday - Saturday). Thursday is the preview sale for consignors & volunteers. Friday & Saturday the sale is open to the public. Saturday select items are 50% off (check the tag for discount option above price). 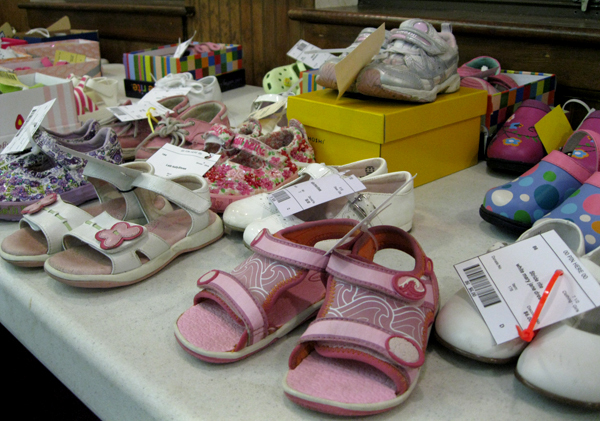 Select unsold items (as dictated by the consignor) are donated after the sale to the Masonic Home for Children in Oxford. Check the website (link below) for future sale dates and information about consigning, volunteering, etc. I needed a rental car and had to go to Pittsboro to get it. Fortunately for us, we picked up our Chevy Malibu right around the corner from Town Lake Park so swung our borrowed wheels by for a visit. My advice is not to go to Town Lake Park for the playground facilities. This is an older place, and the playground shows it. Just a few monkey bars, a balance beam, and some really outdated swings (the bucket swings are the old school ones that have just a chain on one side, yikes!) in pea gravel. There are picnic tables that were just installed earlier this year in a shelter and a soccer field that gets a bit of use. But really, do go here for the little walk with the kids. The pond is really pretty and geese frequent this location and can be fun to feed (even if those suckers have a mean streak, so watch out). The path is clean and tidy. C and I didn't do the entire trail, but it seems like you could easily push a jogging stroller on this. And we had fun on the part we did do. There are two entrances to the trail it turns out. We used the entrance that was off of Highway 87 on Lake Drive. But according to the Pittsboro Park Blog (which is a great resource, by the way) there is also a Diane Street entrance that looks quite nice and has undergone renovations recently. There is close to 1 mile of dirt trail around the 38-acre pond. I have read in some places that it comes close to downtown Pittsboro but since we did not make it that far and I am awful at judging scale on Google maps I simply am not sure how close. Maybe a Pittsboro local can inform us better? Either way, it is a nice little walk through shade trees, some of which are labeled for your education. Perhaps someday the playground area will also see some renovations, and it will be a one-stop wonder! My child is obsessed with animals. Still. Hasn't ended. So in searching for an afternoon learning activity, I decided to dash down to Jordan Lake to see if we couldn't rustle up some Bald Eagle sightings. Jordan Lake is home to the largest concentration of Bald Eagles (which I will capitalize since the birds seem to command it with their majestic presence) in the eastern United States. I have seen them soaring the skies many times before at the Lake. If you head to the Jordan Lake website (which, confession, I have to say I really do not like, but I am here to help you understand it) it lists Bald Eagle Watching in the list of activities. They actually recommend watching for eagles at Vista Point, Ebenezer Church, and Seaforth. Of course, these can be closed during this time of year. So rather than chance a car ride that ends in nothing but gates at the end (it's happened before), we went to the "Wildlife Watching" area on Martha's Chapel Rd. near Farrington Rd. About a half mile down Martha's Chapel after turning from Farrington Road, there is an observation dock. C and I didn't have any luck seeing Bald Eagles. But we weren't there at the best of times. The recommended times for Eagle spotting are early day or late evening, and even better April - June. But we saw a lot of other birds and wildlife. C was definitely enjoying it and turns out he has better eyes than I. Still on the prowl for an Eagle, though, we stopped by Farrington Boat Ramp on the way back to the Hill. DH and I had lots of luck seeing the birds here in the past while kayaking in this area. Although no observation sights in particular, you can park here and stand on the banks of the Lake many places. With views like this: So did we see any? I can't really say. We did see some magnificent birds flying in the distance. I like to think that they were Baldies. And I have to give a shout-out to the Triangle Birder's Guide for having such a great website for activities such as this. See their links below. I can't believe I am writing a post about a pool when I just got back from a ski vacation. But nevertheless, here it is. Pool memberships go quick in these parts, and it's time to plan and apply! For outdoor pools, we have already covered The Y at Meadowmont, Southern Village's Pool, Chapel Hill Tennis Club, Lake Johnson Pool & Sprayground in Raleigh, and the free pool at Hargraves. And in Woodcroft is a community pool with a really awesome slide that we also need to let you know about. The Woodcroft Pool is large, so it can accommodate a lot of people. There is a beautiful 98-foot slide (which rivals the the Kraft Family Y slide), gazebos for shade, two diving boards, lounge chairs, tennis courts, the playground and trail system nearby, and a clubhouse. The facilities aren't the newest or the most modern, but they work. There are swim teams and meets here. Woodcroft Pool membership gets you membership to the Woodcroft Club, which means activities year-round. In fact, if you aren't interested in the pool at all but want to take advantage of the poker nights, kids' lessons, move nights, camps, and more you can sign up for a social membership. Memberships are available right now. And they are running a special waiving initiation fees. However, since Woodcroft is a club and not just a pool, membership fees are assessed year-round and not just once. But then you get benefits for the entire year, so it's a trade-off. There are all sorts of options for pricing, see the links below or call. You do not have to be a resident of Woodcroft community to join this club. By the by, little insider's tip but if you take the Healthy Moms class at the Woodcroft Pool you get in to the pool that day for free and yes, you can take your child down the slide! It seems I have been on a wine and art kick lately. Trying to class myself up after a day of flung food and playground dirt I guess. So when Studio 91 moved to the Glen Lennox area, I thought it would be a great night out with some ladies. Studio 91 was in Meadowmont for years (and years). Yet it kept a low profile. Recently they moved to Glen Lennox, near Jujube and Bin 54. Which means you might notice it as you drive by. It's an unassuming front. Yet inside the owners have tried to merge art and wine into a fun experience. 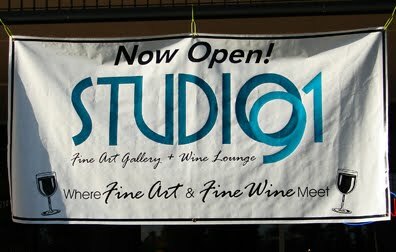 From their website: "Our philosophy @ Studio 91 is to create that comfortable, welcoming neighborhood place where the atmosphere to view & buy art is non-intimidating. And the boutique wine selections are a welcoming change from the ordinary restaurant wine list." There is art all over, tastefully arranged. And there is a fantastic wine list to chose from, by the glass or by the bottle. The wine selection changes monthly and on some nights you can tasting flights. Not a lot of food here, as it isn't a restaurant, but you can get some savories such as cheese plates, meat platters, and more. All of which were surprisingly delicious! If you are really digging on a piece of art, you can certainly speak to someone about purchasing. Think of it as an investment. If you are really a oenophile (that is a word, right?) Studio 91 offers wine lockers for rent and a wine library club. Check online (see below) before you go since Studio 91 is always offering fun deals and specials. As of this posting, if you go for a Ladies Night Out here after 7:30 pm you get free truffles. There are tables outside for seating in nice weather, although you can't really take in the art that way. You don't need to know anything about wine to visit! I have to say that we enjoyed our Girls' Night Out here. And lest the gentlemen think we don't think about them, this would also make a great date night. No we didn't spend time really perusing the art, but we did take it in and talk about some pieces, which isn't too shabby. The atmosphere is cozy (even not inside the spiffy Lounge). The wine was very nice, but of course you pay a little more for better wine. The food, although not intended to be filling, was quite tasty. Parking at Glen Lennox is always a bear, of course, but it's worth it for a swanky night out. 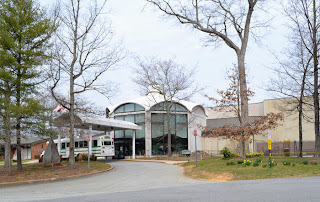 We love the North Carolina Aquariums and while it isn't always easy to get there, a little piece of the aquariums is currently here for your enjoyment. The NC Aquarium at Fort Fisher has loaned a replica of a Megalodon Shark Jaw to Crabtree Valley Mall. 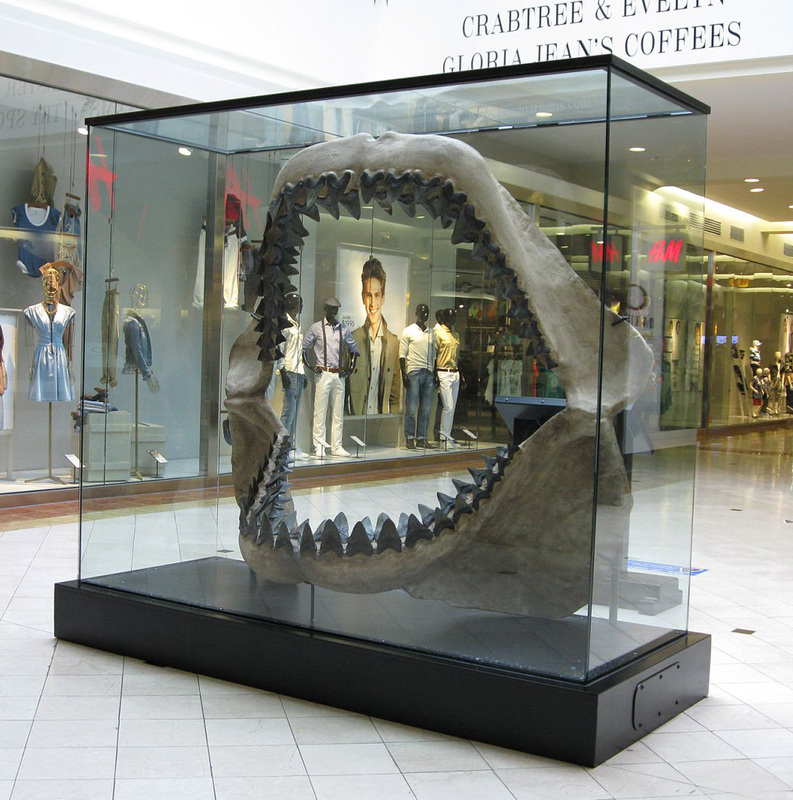 The six foot shark jaw will be on display in Center Court South through May 31, 2011 before being returned to the aquarium as part of an exhibit that opens there in June. The jaw is encased for protection, but never fear if you have little ones like ours that love to touch things. There is an information board with details about the Megalodon Shark and it includes a fabricated tooth that you are encouraged to touch. You'll also see markers on the floor that note the length the shark that owned these teeth would have been. Let's just say I'm happy to have never met one face to face! Parenting is tough, anyone can tell you that. It seems it is even harder these days to raise a child with traditions, values, and a sense of belief. And while I am not Jewish, I was very excited to learn of a program in Cary called "Mommy & Me with a Jewish Twist." Organized by a lovely lady named Chana, this is a series of innovative classes that allow moms and tots to experience Jewish tradition in a stimulating, fun and creative environment. This program is developed with a huge range of kids in mind, anywhere from 3 months to 3 years old. At Mommy & Me parents join their little one for storytelling, puppetry, sensory activities, art, snack, and music & movement with Jewish themes. Children learn new skills and, of course the parents love it too, especially those who can't remember the last time they enjoyed a proper adult conversation! 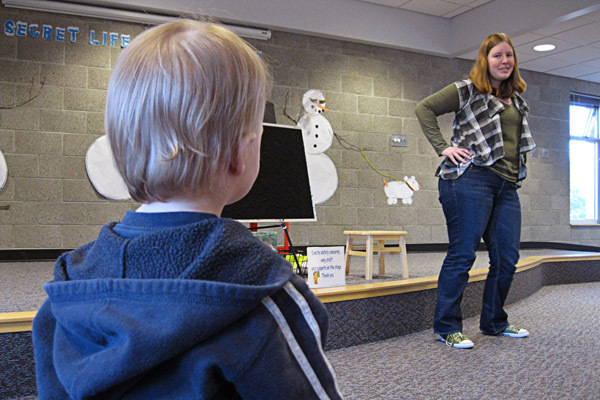 Some classes include a short demonstration presented by a resident mom or local professional. The Mommy & Me group is carefully crafted to reflect progressive educational models and philosophies. Adults here facilitate and guide the kids' educational journeys, always in tune to their individual way of learning and processing information. Based on this approach, the first half hour of our group consists of a center based activity time. These centers reflect the weekly theme and are designed to help children develop a wide spectrum of skills including fine motor, sensory, gross motor, social, and critical thinking all in a developmentally appropriate way. During this time, moms can chat and catch up as well as join their children as they explore the various centers situated throughout the room. The meetings happen from 10:00- 11:00 am on designated Sunday mornings at the Chabad of Cary Learning Center. The meeting room is equipped with quilts, toys, bouncers and books. Healthy snacks for children are served. Classes are $7 per class for 4 classes, or $23 for the entire session (4 classes). You can sign up for all 4 classes, or pop in when your schedule allows it. Complimentary first session for all new participants! To request an information packet and curriculum outline, call Chana at 919-651-9710 or email chana@chabadofcary.org. Read more at WRAL's Go Ask Mom post here. 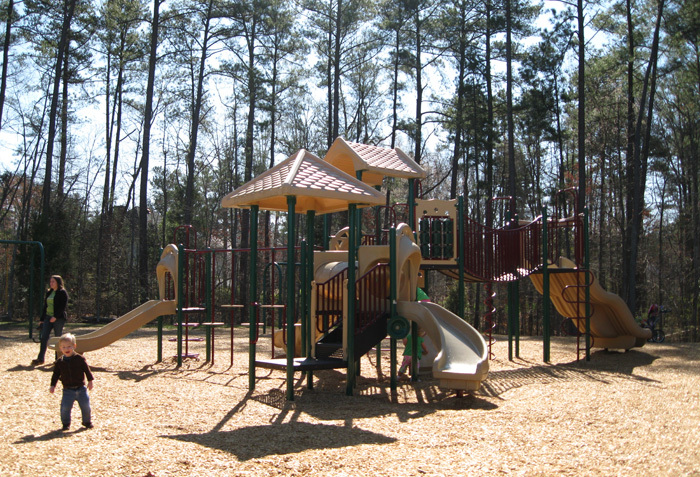 The Woodcroft community in Durham is a great little pocket for family living. This planned community is so conveniently located, minutes away from I-40. This community is different from a Meadowmont or Southern Village. Woodcroft doesn't have a village center. But it does have over 2,000 homes of different sizes integrated with nature alongside of and off of Woodcroft Parkway. There are over 6 miles of trails through Woodcroft, intersecting with the American Tobacco Trail. This is a fantastic spot for walking (in fact, some of our Healthy Moms classes take place here). The paths are paved and generally offer rolling hills, not too steep. Very stroller-friendly here. And if you want to bike, you can go quite a way happily. There are a few major road crossings, but nothing too dicey. Some of the trail parallels Woodcroft Parkway, other parts are through scenic woods. "These paved bike/walk/run paths run through the Woodcroft community in southern Durham, not far from both Southpoint and the paved portion of the American Tobacco Trail, which makes it an ideal way to link up for longer runs starting at the American Tobacco Trail parking areas. The main path runs along the South side of Woodcroft parkway, intersecting the American Tobacco Trail just before Fayetteville Road." Well-maintained landscaped grounds, the ground cover is mulch. Not a lot of shade here. The playground equipment is definitely for the older kids. They can climb quite high here and safety rails are higher up. But it is very nice and worth a stop! Unlike Meadowmont or Southern Village, no food or drinks in walking distance or as a good stroller stop, but there are a lot of options just off of Woodcroft Parkway on each side.